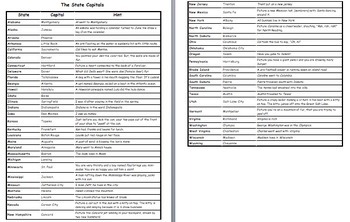 US State Capitals- Hint sheet! The handout includes hints for *almost* all 50 United States and their capitals. The list was put together by myself and my students, as well as a variety of other sources along the way. Use this sheet to help kids memorize all 50 states and their capitals!